I love anything involving business which is why it is no secret that I love ABC’s Shark Tank. This past Friday night’s episode was no exception! For those of you who don’ t know, Shark Tank is a television show that entrepreneurs, business owners and inventors go on to pitch their businesses to the Shark Tank Investors in the hopes they will invest. Last Friday’s episode included two business owners that had clothing lines. I love it when fashion designers and clothing lines go on the show looking to get an investment deal with one or more of the Sharks. I don’t know about other people but every time a fashion label is on the show, I immediately look to see what Damon John of the Fubu Clothing Line is going to do. Damon John is one of the Shark Tank Investors and one of the only Sharks on the show with an extensive background in fashion. The two fashion lines that were on the Shark Tank, Season 5, Episode 15 that aired on Friday, January 24, 2014 were SwimZip by Betsy Johnson and Freshly Picked by Susan Peterson. Damon John decided to pass on Swimzip because he said it was too early to invest in them. SwimZip grossed $225,000 in their third year of business mostly from their online store and independent brick and mortar boutiques. They are also sold on the Target website however they aren’t physically in Target Stores. Betsy Johnson stated that she wanted to get the line in Target. Damon John said that she doesn’t want to that because the returns would kill her and ultimately that was one of the reasons why he decided not to invest. Getting into department stores and when is the right time to try is actually something we talk about in our Official Step by Step Guide to Starting a Clothing Line Book. Many times new designers start off thinking if only they can get their line into a major department store or two that their line will be a success. This could not be further from the truth. A line should not even consider trying to get into a major department store until a few key aspects are met. What new designers don’t realize is that even though say a Neiman Marcus or Macy’s may give them a purchase order – it really is a glorified consignment deal. They will pay you for whatever they sell and send the clothing that they don’t sell right back to you. And guess what else? You will pay the shipping on that return. The returns will come back worn and damaged in many cases from being on the rack. I have personally seen where some department stores will order a large order and then as it get close to the term maturity date – they will send that clothing back only to re-order something different and then do the same thing again. This situation can be a nightmare for new lines when they are depending on that money to come in for their cash flow. Now they not only don’t have the cash from that purchase order but they also have merchandise that they will more than likely have to mark down / discount to move. The reason for the discount is because the clothing is probably out of season now and as I said a little damaged in some cases. When this happens to larger clothing lines, they often have back up plans to send their returns to discount retailers that they work with. However, even then, discount retailers pay pennys on the dollar and even less to new lines. Purchase orders from large department stores work different from purchase orders that are received from independent boutiques. When you accept purchase orders from boutiques, providing you offer credit terms, they are on the hook to pay you whether they sell the merchandise in 30 days or not. They don’t have the option to say we are sending this back to you because we ordered too many or your line didn’t sell like we needed it to. Of course there are other issues with extending credit terms to smaller boutiques but that is one difference between selling to boutiques vs. large department stores. Also note that most department store terms can be anywhere from 60 to 180 days with 90 days being the average. I understand that mostly all fashion labels ultimate goal is to be in department stores but you have to make sure you are ready or you could be eaten alive. I didn’t even talk about marketing, pricing and quality yet. Betsy Johnson is doing it right with her line, however, she may want to steer clear of Target for a little while as Damon John advised. Her strategy of going after independent boutiques and selling from her website is going very well for her. SwimZip ultimately got a deal with Lori Greiner who is known for selling a lot of merchandise on QVC. 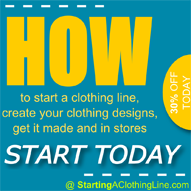 How Do You Know If You Are Ready To Take Your Clothing Line to a Large Fashion Retailer? Sure there are many other factors but these are the major things and each item should not be taken lightly. Lori Greiner said to Betsy Johnson that she would ask Target to give SwimZip terms that would not hurt them. Unfortunately, even Lori Greiner doesn’t have the power to dictate how Target or any other major retailer treats new lines that they are bringing in. This is why Lori Greiner stated she would try because she knew it would be no easy task. But hey, there is no harm in trying. The next entrepreneur fashion line on the episode, Freshly Picked, scored a deal with Damon John of FUBU. Freshly Picked is a moccasin shoe line for babies. Mark Cuban (Shark Tank Investor / Owner of Dallas Mavericks) stated that Susan Peterson should be covered in business books because of how she creatively came up with funding for her fashion label. Her brother has a window repair company so she would take the aluminum window frames he removed from client houses and convert them into cash by selling them as scrap. The aspect of her story that is also very impressive is her company grossed $500,000 in sales in 2013. She came on the show hoping to get a deal with Damon John and she left with one. Both of these fashion lines have something in common. They were started by regular people who didn’t go to fashion school yet they both are doing very well in the fashion industry. They also both serve niche markets. They are not trying to be everything to everybody. 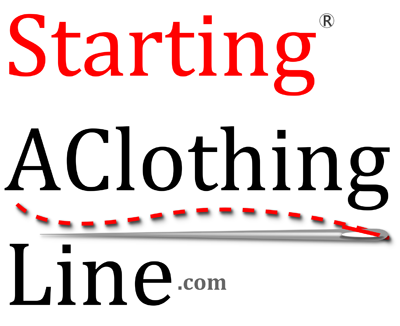 I always advise clients directly and through our how to start a clothing line course that they should start off with a niche or one aspect of fashion. New clothing lines that try to do too much too fast often run into major problems. It also cost a lot more money to try to create a huge line. My advice is that a new designer should always specialize in something and be great at it such as Susan Peterson with her baby moccasins. After you have mastered something, then you can seek to add new elements to your fashion label. Be sure to watch Shark Tank on ABC on Fridays. It is a great show for those who love business and fashion. * To learn how to design your own clothing, shoes and handbags – Check out Digital Fashion Pro.